Are you feasting on anything wonderful this weekend? We've been eating well and close to home: breakfast was organic pb&j on Farmhouse White with glasses of local raw Jersey milk, consumed during this morning's power outage (another thunderstorm—yay! ), and lunch was last night's leftover frittata made with our own eggs and ground beef, onions and freshly snipped chives, and doused with Sriracha sauce (or at least mine was). Tonight we're grilling a couple of homegrown, grass-fed Angus rib steaks that we'll enjoy with a warm hunk of crusty baguette made with homebrewed beer, sweet red peppers from the kitchen garden dipped in Easy Lowfat Buttermilk Ranch Dressing, and a beautiful plate of sliced heirloom tomatoes—at last! Simple food that tastes so good. 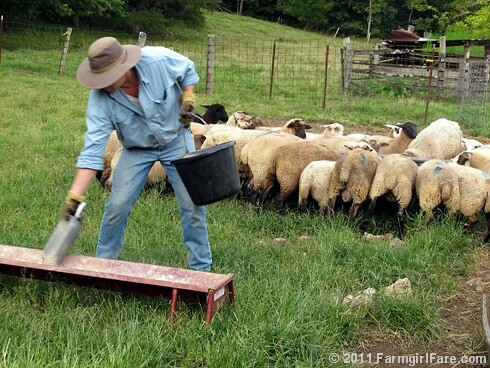 © FarmgirlFare.com, where those blue stripes on the backs of the lambs are made with special marking crayons we use to mark the sheep while working them, so we don't treat anybody twice. What a tasty homegrown feast! Your food sounds so delicious!! My brother makes your Farmhouse White frequently and gives me a loaf (aren't I lucky?)!!! And Hoorah! for tomato season. 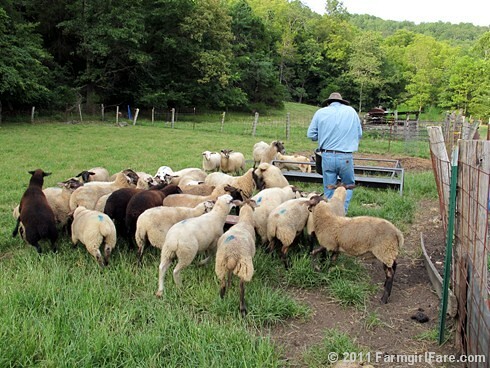 Thanks, too, for the explanation about the blue markings on the backs of the sheep - I was wondering! The lambs look really happy with their treats and I bet you guy were LOVING yours!! My tomatoes are just now ripening too! YAY! !